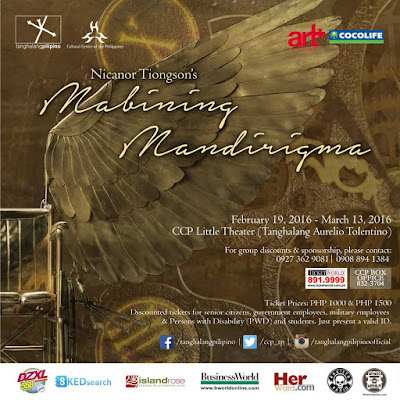 With the overwhelming success of its initial run last July 2015 at the Cultural Center of the Philippines, Tanghalang Pilipino, the resident theater company of the Cultural Center of the Philippines, with the support of the National Commission for the Culture and Arts, brings back the hit musical play, Mabining Mandirigma to cap off its 29th theatre season. Written by Dr. Nicanor Tiongson, this musical play foregrounds the legal and diplomatic heroism of Apolinario Mabini. 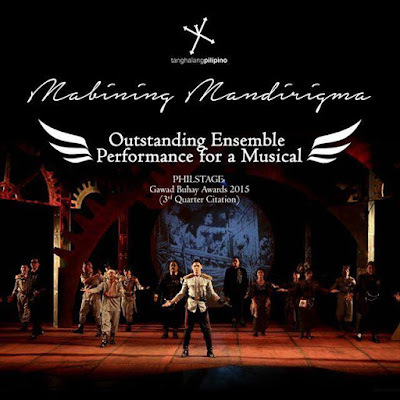 Coincidentally, as the culminating production to commemorate the sesquicentennial birth of who was considered the brains of the revolution, Mabining Mandirigma, once again promises audience to an exciting journey through history as it utilizes Steampunk, a subgenre of science fiction that incorporates technology and aesthetic designs inspired by 19th Century industrial steam-powered machinery, as a fitting backdrop to an already action-packed musical. Mabining Mandirigma, A Steampunk Musical runs from February 19 to March 13, 2016, Fridays to Sundays, with 3:00PM (Matinee) and 8:00PM (Gala) shows at the Cultural Center of the Philippines’ Tanghalang Aurelio Tolentino (Little Theater). 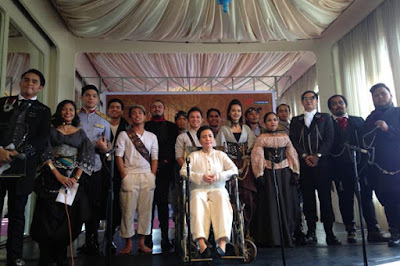 Directed by the Cultural Center of the Philippines’ Vice President and Artistic Director Chris Millado and written by Dr. Nicanor Tiongson, the stellar cast is led by Leisl Batucan essaying the role of Apolinario Mabini; promising young 2 tenors Arman Ferrer and David Ezra alternate as Emilio Aguinaldo, while Carol Bello plays Mabini’s Mother, Dionisia. To those who will avail of our ARTIST/COSPLAYER PROMO: Kindly reserve your tickets and settle the payment on or before March 1, 2016. 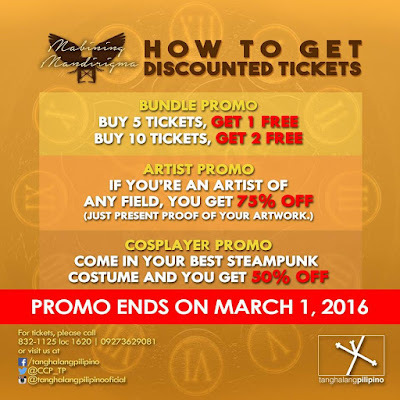 Promo ends on March 1, 2016, so buy your tickets now!